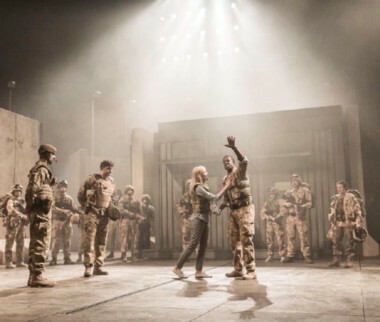 It’s a coincidence, but not a surprise, that both productions of Othello I’ve seen recently are set on military bases in today’s Middle East. The garrison in Shakespeare’s tragedy isn’t that far from an outpost in Kandahar. The same rules of life in the battle zone apply: the peremptory chain of command, the hair-trigger emotions stirred by dangerous deployment, and most important, the implicit trust in the comrades-in-arms your life depends on. Both productions evoked that atmosphere, along with the camouflage fatigues and semi-automatic sidearms of today’s soldier, but also diverged sharply. Where the Royal National Theatre’s staging, beamed from London in its NT Live-to-cinema series, boasted 20 performers, an expansive stage and a budget to match, the local offering by Real Live Theatre was performed in a bare room under fluorescent lights with a cast of eight. That said, both were examples of Shakespeare at his riveting best, giving a spine-tingling urgency to the 400-year-old tale of the black general in a white world who’s led, by loving “not wisely but too well,” into jealousy and murder. Real Live Theatre is a brand-new ensemble that brings a thrilling immediacy and creative savvy to the stage. Founded by alums of Serious Play’s training program, its focus is on the actors’ intense physical presence. In Ellen Morbyrne’s production at Gateway City Arts in Holyoke, the performers sat among the audience on folding chairs, entering into the bare playing space on cue but never really out of the action. In this present-day setting, Othello was not a “Moor,” but a Puerto Rican, affectingly embodied by Arnaldo Andre Rivera, who had a couple of exchanges in Spanish with his lieutenant Cassio (Mike Pray). Thanks to some plausible cross-gender casting, half the cast was female, and included feisty performances by Emma Jimerson as Othello’s wife Desdemona and Monica Giordano as Iago’s wife Emilia. For me, the defining performance was Dan Morbyrne’s as the “demi-devil” who ensnares the trusting Othello. His Iago was a playful, loose-limbed fellow whose lying tongue spoke in hip-hop rhythms—a brilliant incarnation of the modern warrior. In the National Theatre production, which has repeat screenings at Amherst Cinema this weekend and later this month, Rory Kinnear’s Iago is the same breed—street-bred and sassy, this time with a Cockney accent. He’s the perfect foil for Adrian Lester’s poised, charismatic Othello, and it’s breathtaking to see Iago’s game of lies and innuendo lead the proud man to destruction. Director Nicholas Hytner says “the army is absolutely central” to his concept, and designer Vicki Mortimer’s set of uprearing cement barricades and klieg lights not only sets that tone but is also constantly shifting to reveal ever-more-confined spaces, as unstable as the plot’s plunging swings of fortune. In a cast as strong and supple as you would expect in Britain’s premier playhouse, there’s one jarring note. In an apparent attempt to present Othello’s blonde bride Desdemona as more spirited and independent than she’s often portrayed, Olivia Vinall, dressed incongruously in faded blue jeans, comes off more like a frisky adolescent than a general’s wife.